Lilies are distinctive bloomers with sturdy, upright stems. Although the blooms look exotic, lilies aren't difficult to grow and require a minimal amount of care. However, most lilies must be divided every four or five years to keep them looking their best. If the stems look spindly and crowded, and the blooms are few and far between, it's time to divide the lily bulbs. 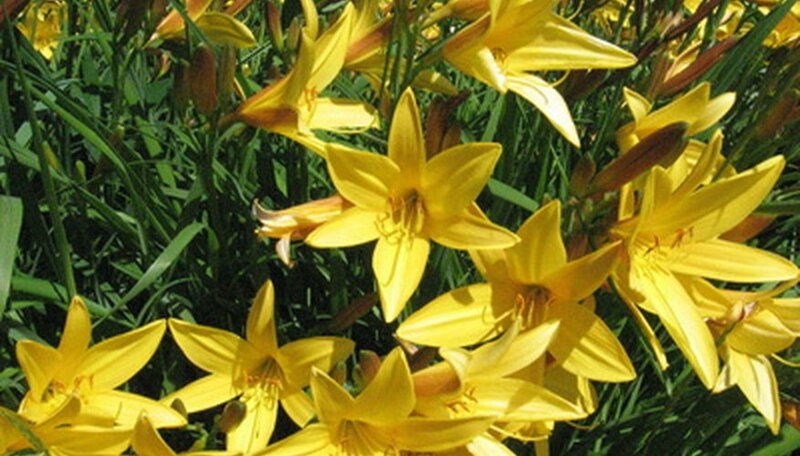 For the best chance of success, divide lily bulbs in autumn, after the plant has finished blooming and the foliage turns yellow. Prepare a spot for the divided lily bulbs in full sunlight and well-drained soil. Use a shovel or a garden fork to work the soil to a depth of 8 to 10 inches. Mix in 2 to 3 inches of compost or rotted animal waste. Insert a spade or garden fork into the ground about 6 inches from the lily plant. Rock the spade or garden fork back and forth to loosen the roots. Continue around the perimeter of the plant. Dig deeply to avoid damaging the roots, then lift the lily plant carefully from the soil. Divide the small bulbs, separating them from the stem with your fingers. Remove any old, soft or rotten bulbs and discard them. Return the main bulb to its original place. Plant the newly-divided lily bulbs in the prepared spot. Use a trowel or a shovel to dig a hole 2 to 4 inches deep. For the best appearance, plant the bulbs 8 to 12 inches apart in groups of three to five bulbs. Allow 3 to 5 feet between each group, depending on the expected size of the lily at maturity. Water the area immediately after planting. Cover the newly-divided bulbs with 4 to 6 inches of organic material such as compost, bark chips or dry leaves. Mulch will insulate the soil and allow the bulbs to establish before the first hard freeze. Remove the mulch after the last freeze in early spring so the bulbs can grow freely.